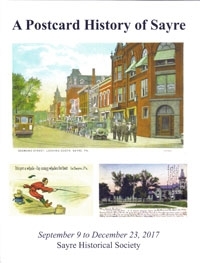 A 28-page soft-cover booklet highlighting the recent exhibit at the Sayre Historical Society. The all-color booklet, printing on glossy paper, includes over 50 postcard views including a real photo postcard of Keystone Park, pre-war German postcards of scenes from Sayre's past, Lehigh Valley Railroad shops and the Robert Packer Hospital. Many of the postcards are from the collection of the late Marty Smith of Sayre. Stock#0214 Price - $9.43 plus .57 tax. Total $10.00 plus $5.00 shipping and handling.